label.blancodisco Just another electronic music netlabel, by benny blanco®. Hello world, Welcome to label.blancodisco! with Traktor beat grids, waveform analysis and bpm embedded already. A few months have passed since our last release, so I’m very happy to get #3 finally out. Bittah Kru was a collaboration project between benny blanco®, jonny massif & redboy and the name is derived from the 3 member’s heavy interest in beer. If we made a beer, it would be called Bittah Bru. The first 3 tracks were rendered over the course of a jonny massif weekend stay in boston at the blancodisco in 1997. Benny & Mr. Massif miraculously cranked out 3 tunes. The final track on the EP was produced a year before that in 1996 while Redboy par-toke in a weekend stay in boston as both jonny massif & redboy resided in nyc. The EP is special as it was a real time performance for mixdown. All tracks were played off the mixing desk and synths tweaked as the jam session progressed. Only a few minor edits were made too truncate the recordings to a more reasonable length and structure. (A1) Six Pack is deep space electro track with washing synths pads and melodies. The drums patterns were already pre-programmed on a Boss DR-660 drum machine. All the synth noises (bass, pads, melody) were all derived from the lovely synth with the big red knob, Waldorf Microwave I. Filters/EQs were manipulated for real time filter sweeps in the manner that a dj would tweak the dj mixer. This track was produced relatively quickly, about 3 hours. (A2) Clean My Heads. This was the last track Blanco & Massif produced over the weekend sessions. It was Sunday morning and Massif had to catch a train back to NYC. I think we literally cranked this out in an hour. It’s the most ‘experimental’ sounding of the lot here. This bass drum heavy track utilized the German XBase 09 for almost all of the drum noises. Real Time manipulation was of course essential here too. Drums were programmed fairly quickly. We sequenced a few other synth noises as rhythmic elements and started jamming out. We hit record on the DAT machine and started messing about with fx sends and tweaking a BOSS PS-5 Pitch Shifter and Boss DD3 Digital Delay Pedals to create the tape dub delay like effects to create the arrangement. (B1) Newman Stole My Car. Melodic Pitched Kick Drums from the XBase09, 808 like snares and shuffled hi-hats were the core to this retro inspired electro track. Dissonant almost out of tune synth cast a melancholy mood to this track. Certainly not peak dancefloor material the track is geared more for the head. We thought it was reminiscent of something maybe Gary Numan might have done, sans vocals of course. This is the most thematic track of the EP. A nice drum breakdown / build up in the middle makes it choice for the breakdancer in you. Could work as a closing track in your electro inspired dj mixes. Give it a try. (B2) Mode Funk. When inspiration strikes, one must compose and record. It was just another drinking weekend for redboy in Boston, 1996, when something triggered the two playahs to get productive in the studio. This track is the fruits of this session. This was the most produced track on the EP as we spent the most time crafting the sounds, arrangement and the performed mixdown to DAT. This funky downtempo acid bobber has older Depeche Mode like keyboard lines/sounds, but it the familiar funky acidisms of the TB-303 that come center stage. The dubby rolling bassline keeps thing rooted at the base. Boss’ DR-660 provided the Beats. I’d also love to read your comments. Bittah Kru EP by bittah kru is licensed under a Creative Commons Attribution-Noncommercial-Share Alike 3.0 United States License. Here we are at blancodisco release #2…. and just a week or so later from the initial launch of the label. 3 tracks presented here all with an appearance from our good friend, Mr. Acid (TB-303). Again, the tracks have been recently remastered from the last version of ‘final, final final’ mixdowns I had. “Discipline” opens the EP and is a bit more foot forward techno. Has a bit of grit/edge to the overall sound, but not distorted. So those liking a bit harder sound, may enjoy this. Maybe a touch of Hardfloor charm, but certainly not going to fool you. 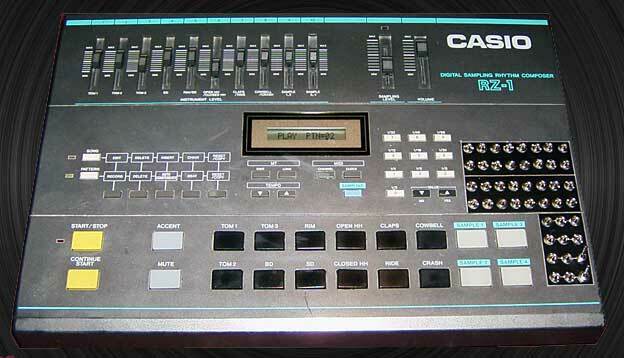 The Casio RZ-1 drum sounds in all their 12 Bit glory grit out their patterns. “Offset” is a bit more minimal and deeeEeeep in tone and I believe was inspired by Mark Broom. He was a heavy influence in minimal quirky techno records that were coming out at the time. I think the biggest influence of the Mark Broom sound in this track comes in the form of the rolling bassline that has a bit of funk to it. There’s also a nice off kilter 303 line too weaving in and out. The Waldorf uWave fills in the middle with some dark pads. The B-Side, “Killing In Mind” is owned by the rolling dub bassline that runs pretty much throughout the track after it is introduced in the arrangement. Again, the 303 takes center stage and plays a slowed down dirty acid funk that never ceases to lose interest in its progression in a repeated pattern. The balance of the track is offset by some really sad keyboard pads provided by the Juno-106. The track was inspired or came to fruition cause I had a crush on a girl that just wasn’t interested. So, I was a little pissed and this is the result of that frustration. And as a final note, these set of tracks where recorded when we had our Ohm Recordings label going. We had an actual office (in the basement) of all things on Boylston St across from the Boston Public Library where huge dance parties (raves) where organized via Primary Productions and then we had our label and studio setup. It was pretty sweet. Task EP by benny blanco® is licensed under a Creative Commons Attribution-Noncommercial-Share Alike 3.0 United States License. Looking for some early 90’s organic psychedelic head trippin acid or some ambient 808 electro techo-acid? Look no further. These two tracks have been recently been remastered here at the blancodisco studio (and still not bob ludwig’d), but definitely better than that mixes originally coming off of the DAT. “Continuum” was originally recorded in my basement studio at 63 Park Drive in the “Fens” of Boston in the early 1990’s. The Original mix is just an organic and melodic acid track with a continuously looping 16 bar drum pattern (909 samples playing on an E-mu Emax Rack Sampler). There’s also a nice old school 8th note Gated Synth effect where I had something I forgot what, trigger the gates on the Alesis 3630 Compressor on another Pad. The whole point of this track is to make these TB-303s Sing. I think I did allright in this department. The original and the 303 Acidpella for “Contambient” was recorded through a very old Roland 24 channel line mixer that had no eq and recorded direct to the Yamaha DAT player I had at the time. The mix was done live/improvised. The sequences just looped and I played the board, sequencer mutes (opcode studio vision pro), of course the 303s knob twiddling. Old school electronic jamming. The B-Side, “Contambient“, was recorded a few years later in the Ohm Recordings basement offices/studio on Boylston St. where I had access to label partner Steve Baron‘s, TR-808. I recorded this piece using an acidpella recording of my two 303 from the initial Park Drive sessions and added the 808 drums and ethereal pads off of the E-mu Emax sampler. I particular love this patch as I have an old Rising High record that uses this exact same patch. The recording is especially important for one, it’s one of my earliest 303 recordings I had made shortly after acquiring my 2nd TB-303. One final note is that the chord progression in the original was inspired by M. Coleman Horn. I met him through Fred Giannelli and I think Coleman had stopped by the studio one day when I was just getting going on this session. For whatever reason, these are the bits I’m remembering about this release. Continuum by benny blanco® is licensed under a Creative Commons Attribution-Noncommercial-Share Alike 3.0 United States License. I’m pleased to finally announce the launch of the blancodisco net label. A place for high quality packaged digital releases for listening and dj’ing. This project has been an ambition of mine for quite some time now and I’m just happy I’ve finally gotten ’round to doing it. As you can see, I like orange. Over time, I will be messing with the design/theme templates and change things up as we grow here. Most of the work will derive from label head, benny blanco®, but down the road, we may see some releases from some friends and fans. The music featured on blancodisco will most likely be electronically based. No rock, hip hop, folk, country, classic, showtunes…. I think you get the picture. I think after the initial releases are published, you’ll get a pretty good picture of what we are about. I’ll do my best to release something decent, but if it isn’t quite up to par, it’s only because I have a strong emotional attachment to the music itself. No bother to you though, except for you time. The files are provided free of charge and are incorporating the use of creative commons licensing. Please be sensible. travel far and wide throughout the web and that you will continue to return to see what’s up with my musical contributions.